A quote that is misattributed to Voltaire reads, "I disapprove of what you say, but I will defend to the death your right to say it." According to Evelyn Beatrice Hall, this was Voltaire's attitude toward material by Claude Adrien Helvétius. Voltaire is incorrectly called an atheist. He was actually a Deist who detested many religious dogmas, and believed in freedoms of religion and expression. The attitude of disapproving of what is said but defending the right to say it is sadly lacking in modern society; people screaming for "tolerance" are extremely intolerant. Even a cursory search will show that there is intense persecution of Christians, especially in countries run by atheists and Mohammedans. And it's only beginning. Edit: Around the time that I published this article, "Stand Up for the Truth" had a segment on persecution. To hear that, click on "Is Christian Persecution Coming to America?" It's free to listen online or download. The segment that is relevant to this topic begins at the 22:15 mark. In addition, Doug McBurney's "The Weekly Worldview" podcast on the same day this was published had some material about how Christians are losing our freedoms. To hear Doug's uncompromising, direct, and sometimes humorous material (again, for free), click on "Criminal Christianity". Persecution for Christians is not just something related to the Eastern world, but is increasing in the West. But here, we're not being dragged from our homes or churches and given public executions in organized murders. Not yet. 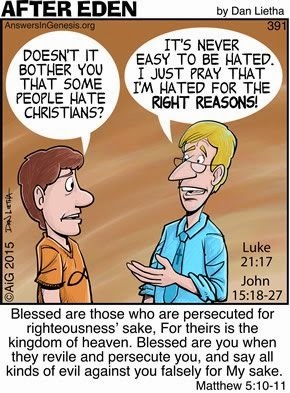 Amazingly, some atheists claim that there is no persecution of Christians, and that they are the ones being persecuted! That ain't happening, old son, except in a few countries where (you guessed it) Mohammedans are in power. Good luck finding evidence of widespread persecution of atheists in Western countries, especially since secularism is favored. I have said several times that atheists, leftists and anti-creationists want us silenced. Persecution of Christians and creationists in the West is currently relegated to leftist and atheistic activism, resulting in our rights to free speech and religious expression getting stripped away. Occasionally, the seething hatred and rage for Christ and his people boils over (see documentation in "Atheism's Faulty Moral Compass and Consequences"), but violence against us is not quite an organized effort yet. "How do atheopaths and leftists try to silence you, Cowboy Bob?" I'm glad you asked. In my experience and observations, they seek to negate what we have to say. This is going beyond simply disagreeing with what has been said and then giving a reasoned response as to why the disagreement. No, this kind of negation is rooted in hatred, and many logical fallacies such as ad hominem, appeal to ridicule, cherry picking the data (suppressed evidence), poisoning the well, straw man, equivocation, and others (see my "Logic Lessons" articles for more information). The point to such activities (in addition to expressing hate and rage) is to convince others to avoid even hearing what Christians and biblical creationists have to say. Why listen when we're "bad" and "stupid"? Unfortunately, people are not being taught to think for themselves, and "think" with their emotions, and atheopaths are very fond of manipulating emotions. By the way, one tinhorn took the bait that I live in a trailer park, and used that for a point of mockery — as if someone's residence means that they have nothing to say. If you visit forums, groups, and social media, you'll often find atheist material that is devoid of reason and heavy on the hate. Anyone with a grain of sense can see the blatant misrepresentations and Bible-bashing. Also, they will misrepresent Christianity (indeed, all of "religion") by cherry-picking an article about dunderheads who happens to have a religious affiliation. Their "logic" is an attempt to manipulate emotions through ridicule, and it can be restated this way: "Here is a bad Christian. This indicates that the Bible is false. Therefore, there is no God and atheism is proven!" Not hardly! All these antics do is demonstrate how hatred interferes with actual thought. This is well in keeping with the rise of atheo-fascism. We get a lot of this at The Question Evolution Project. It gets very bad on the cesspools of Twitter and YouTube, but I don't want to make this article too heavy on the graphics and slow down your browser. Three graphics are enough, wouldn't you say? On a side note, Eugenie Scott of the National Center for Evolutionary Indoctrination — I mean, Science Education — only wants the happy shining good face of Darwinism presented, and none of the controversy among evolutionists. That's not education, Eugene. People cannot think critically under deceptive conditions. See "Evolutionary Theory Evolves" for more. To persecute creationists and Christians, personal attacks and caricatures are the beginning. Then we're vilified, and the intensity increases (I recommend that you read "The Rise of Anti-Christianity in the West"). Using straw man arguments and the claim that "Stupid beliefs make people do stupid things" (ironically used by militant atheists who have appallingly bad reasoning abilities and do very stupid things themselves), they appeal to the unreasonable fear that "religious" people will think that "God told me to kill people", or some such notion. If people bothered to examine the Bible instead of listening to what militant atheists tell them what it says, they would find no justification for the actions of isolated owlhoots who hear voices; the Bible teaches love for enemies and presenting the gospel message, not attacking them on the streets. Now for the subject of trolling (no, I'm not heading off on a new trail, just ride with me a mite longer, we'll come back). Trolling has been around teh interwebs for decades. I reckon that many people have done a little bit of it in the past, and may so some now and then to provoke reactions. But serious trolls are often very disturbed indeed. It is interesting that militant atheists seem to be the ones doing most of the trolling, and they have exhibited many signs of being mentally unbalanced (see "It All Adds Up — Many Atheists Are Nuts" for more information and documentation). But I maintain that it's not just about intellect and some mental aberrations, it's a spiritual matter (Romans 1:18-24). This is called the "noetic effects of sin". These people are in rebellion against God and the authority of his Word. A Texas-sized irony is that anti-creationists and atheists who go on the attack are claiming to have a moral obligation to abuse, ridicule, negate, and even silence their opposition. Where do they get their "moral obligation"? Imagination and hatred, mostly. Oh, and redefining reality to suit their presuppositions helps loads. What do we learn from all of this? Active persecution of Christians is rampant in the East, but is currently more subdued in the West. Currently, persecution is in the realm of legislation, as well as attempts to manipulate emotions so that people will despise a false image of creationists and Christians; can't have people learning what we actually believe and teach, no sireee. 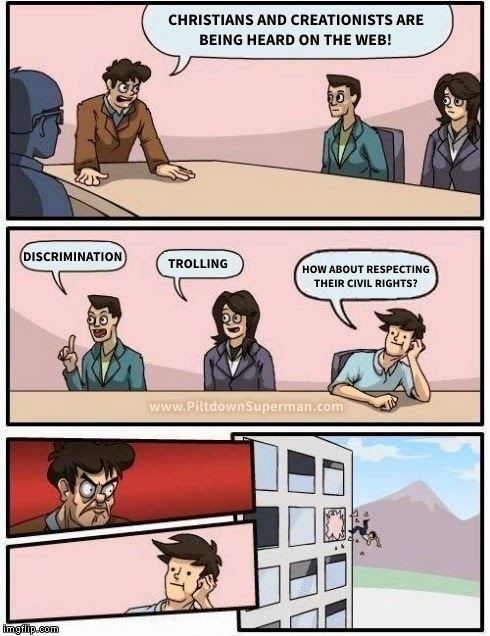 Although trolling is occasionally done by people wanting to stir the pot, a great deal of it is done by atheists and anti-creationists who want to silence Christians and biblical creationists. (The atheists and evolutionists who do not engage in this kind of behavior are strangely silent. Indeed, they give tacit approval by not rebuking their own for acting up. Too bad people with Voltaire's truly tolerant attitudes are fading away.) It is not just a mental problem, but a spiritual problem because they are in rebellion against God and his Word. We will suffer persecution, that's guaranteed (2 Timothy 3:12, John 15:20), and they are adding to our reward in heaven (Matthew 5:12). Even so, we must remain faithful and proclaim the truth. It helps to learn how some of these are manipulating others, show the errors, and encourage people to think for themselves. No matter what, we give glory to God!